people of Oshawa and surrounding areas for more than 50 years. 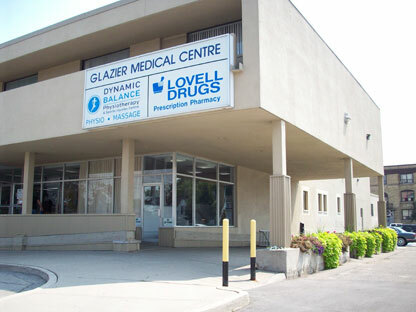 The origins of the Glazier Medical Centre date back to 1951 when Dr. Edward Glazier returned to his home town of Oshawa, upon successful completion of his medical studies, internship and residency in Family Practice. Dr. Glazier began as a sole practitioner and eventually was joined by some collegues for the purpose of forming a group practice. In 1956 Dr. Edward Glazier together with a few physicians purchased the building at 136 Simcoe Street North in Oshawa. Between 1956 to 1970 the group practice had grown significantly whereby in 1970 they sold the old building and moved to their current location of 11 Gibb Street in Oshawa. It is here that the group, which started with the vision of one physician, grew to a multi-disciplinary, multi-services health care centre. Today, a wide range of medical physicians and other health care professionals provide various services to the residents. Presently there are 30 physicians practising from Glazier Medical Centre both in family medicine and other medical specialities. You will also find several diagnostic services being offered such as Diagnostic Imaging (xray and ultrasound), Laboratory services and Cardiac assessments. The Centre has partnered with other allied health care professionals who provide services such as a dental, optometry, physiotherapy and chiropody.